A number of instruments inform the pilot of the aircraft’s condition and flight situations through the measurement of pressure. Pressure-sensing instruments can be found in the flight group and the engine group. They can be either direct reading or remote sensing. These are some of the most critical instruments on the aircraft and must accurately inform the pilot to maintain safe operations. Pressure measurement involves some sort of mechanism that can sense changes in pressure. A technique for calibration and displaying the information is then added to inform the pilot. The type of pressure needed to be measured often makes one sensing mechanism more suited for use in a particular instance. 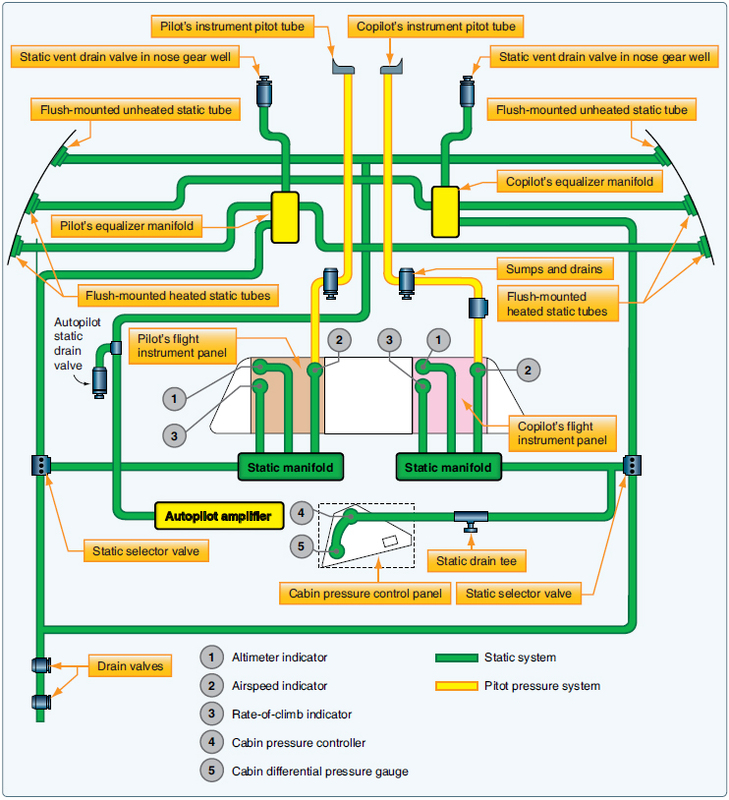 The three fundamental pressure-sensing mechanisms used in aircraft instrument systems are the Bourdon tube, the diaphragm or bellows, and the solid-state sensing device. A Bourdon tube is illustrated in Figure 1. The open end of this coiled tube is fixed in place and the other end is sealed and free to move. When a fluid that needs to be measured is directed into the open end of the tube, the unfixed portion of the coiled tube tends to straighten out. The higher the pressure of the fluid, the more the tube straightens. When the pressure is reduced, the tube recoils. A pointer is attached to this moving end of the tube, usually through a linkage of small shafts and gears. By calibrating this motion of the straightening tube, a face or dial of the instrument can be created. Thus, by observing the pointer movement along the scale of the instrument face positioned behind it, pressure increases and decreases are communicated to the pilot. 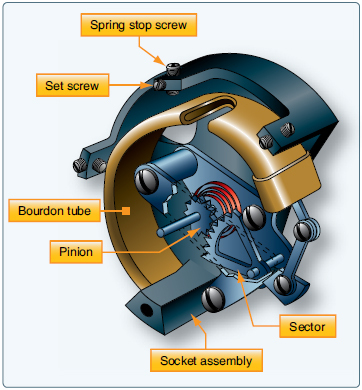 The Bourdon tube is the internal mechanism for many pressure gauges used on aircraft. When high pressures need to be measured, the tube is designed to be stiff. Gauges used to indicate lower pressures use a more flexible tube that uncoils and coils more readily. Most Bourdon tubes are made from brass, bronze, or copper. Alloys of these metals can be made to coil and uncoil the tube consistently numerous times. Since the sensing and display of pressure or temperature information using a Bourdon tube mechanism usually occurs in a single instrument housing, they are most often direct reading gauges. But the Bourdon tube sensing device can also be used remotely. Regardless, it is necessary to direct the fluid to be measured into the Bourdon tube. For example, a common direct-reading gauge measuring engine oil pressure and indicating it to the pilot in the cockpit is mounted in the instrument panel. A small length of tubing connects a pressurized oil port on the engine, runs though the firewall, and into the back of the gauge. This setup is especially functional on light, single-engine aircraft in which the engine is mounted just forward of the instrument panel in the forward end of the fuselage. However, a remote sensing unit can be more practical on twin-engine aircraft where the engines are a long distance from the cockpit pressure display. Here, the Bourdon tube’s motion is converted to an electrical signal and carried to the cockpit display via a wire. This is lighter and more efficient, eliminating the possibility of leaking fluids into the passenger compartment of the aircraft. A diaphragm used for measuring pressure. Diaphragms can also be sealed. The diaphragm can be evacuated before sealing, retaining absolutely nothing inside. When this is done, the diaphragm is called an aneroid. Aneroids are used in many flight instruments. A diaphragm can also be filled with a gas to standard atmospheric pressure and then sealed. 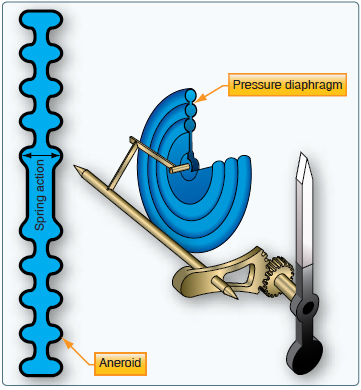 Each of these diaphragms has their uses, which are described in the next section. The common factor in all is that the expansion and contraction of the side wall of the diaphragm is the movement that correlates to increasing and decreasing pressure. Diaphragms, aneroids, and bellows pressure sensing devices are often located inside the single instrument housing that contains the pointer and instrument dial read by the pilot on the instrument panel. Thus, many instruments that make use of these sensitive and reliable mechanisms are direct reading gauges. But, many remote sensing instrument systems also make use of the diaphragm and bellows. In this case, the sensing device containing the pressure sensitive diaphragm or bellows is located remotely on the engine or airframe. It is part of a transducer that converts the pressure into an electrical signal. The transducer, or transmitter, sends the signal to the gauge in the cockpit, or to a computer, for processing and subsequent display of the sensed condition. 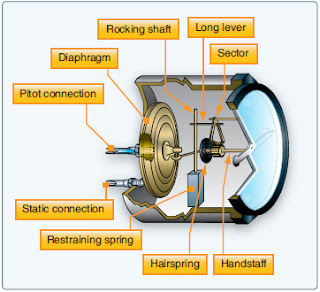 Examples of instruments that use a diaphragm or bellows in a direct reading or remote sensing gauge are the altimeter, vertical speed indicator, cabin differential pressure gauge (in pressurized aircraft), and manifold pressure gauge. Solid-state microtechnology pressure sensors are used in modern aircraft to determine the critical pressures needed for safe operation. Many of these have digital output ready for processing by electronic flight instrument computers and other onboard computers. Some sensors send microelectric signals that are converted to digital format for use by computers. As with the analog sensors described above, the key to the function of solid-state sensors is their consistent property changes as pressure changes. The solid-state sensors used in most aviation applications exhibit varying electrical output or resistance changes when pressure changes occur. Crystalline piezoelectric, piezoresistor, and semiconductor chip sensors are most common. In the typical sensor, tiny wires are embedded in the crystal or pressure-sensitive semiconductor chip. When pressure deflects the crystal(s), a small amount of electricity is created or, in the case of a semiconductor chip and some crystals, the resistance changes. Since the current and resistance changes vary directly with the amount of deflection, outputs can be calibrated and used to display pressure values. Nearly all of the pressure information needed for engine, airframe, and flight instruments can be captured and/or calculated through the use of solid-state pressure sensors in combination with temperature sensors. But continued use of aneroid devices for comparisons involving absolute pressure is notable. Solid-state pressure-sensing systems are remote sensing systems. The sensors are mounted on the aircraft at convenient and effective locations. Pressure is a comparison between two forces. Absolute pressure exists when a force is compared to a total vacuum, or absolutely no pressure. It is necessary to define absolute pressure, because the air in the atmosphere is always exerting pressure on everything. Even when it seems there is no pressure being applied, like when a balloon is deflated, there is still atmospheric pressure inside and outside of the balloon. To measure that atmospheric pressure, it is necessary to compare it to a total absence of pressure, such as in a vacuum. Many aircraft instruments make use of absolute pressure values, such as the altimeter, the rate-of-climb indicator, and the manifold pressure gauge. As stated, this is usually done with an aneroid. The most common type of pressure measurement is gauge pressure. This is the difference between the pressure to be measured and the atmospheric pressure. The gauge pressure inside the deflated balloon mentioned above is therefore 0 pounds per square inch (psi). Gauge pressure is easily measured and is obtained by ignoring the fact that the atmosphere is always exerting its pressure on everything. For example, a tire is filled with air to 32 psi at a sea level location and checked with a gauge to read 32 psi, which is the gauge pressure. The approximately 14.7 psi of air pressing on the outside of the tire is ignored. The absolute pressure in the tire is 32 psi plus the 14.7 psi that is needed to balance the 14.7 psi on the outside of the tire. So, the tire’s absolute pressure is approximately 46.7 psi. If the same tire is inflated to 32 psi at a location 10,000 feet above sea level, the air pressure on the outside of the tire would only be approximately 10 psi, due to the thinner atmosphere. The pressure inside the tire required to balance this would be 32 psi plus 10 psi, making the absolute pressure of the tire 42 psi. So, the same tire with the same amount of inflation and performance characteristics has different absolute pressure values. Gauge pressure, however, remains the same, indicating the tires are inflated identically. It this case, gauge pressure is more useful in informing us of the condition of the tire. Gauge pressure measurements are simple and widely useful. They eliminate the need to measure varying atmospheric pressure to indicate or monitor a particular pressure situation. Gauge pressure should be assumed, unless otherwise indicated, or unless the pressure measurement is of a type known to require absolute pressure. In many instances in aviation, it is desirable to compare the pressures of two different elements to arrive at useful information for operating the aircraft. When two pressures are compared in a gauge, the measurement is known as differential pressure and the gauge is a differential pressure gauge. 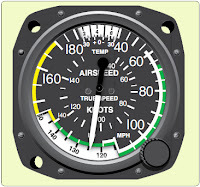 An aircraft’s airspeed indicator is a differential pressure gauge. It compares ambient air pressure with ram air pressure to determine how fast the aircraft is moving through the air. 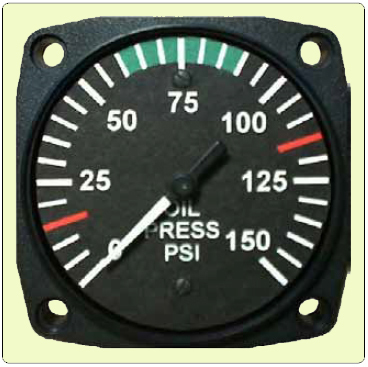 A turbine’s engine pressure ratio (EPR) gauge is also a differential pressure gauge. It compares the pressure at the inlet of the engine with that at the outlet to indicate the thrust developed by the engine. In aviation, there is also a commonly used pressure known as standard pressure. Standard pressure refers to an established or standard value that has been created for atmospheric pressure. This standard pressure value is 29.92 inches of mercury ("Hg), 1,013.2 hectopascal (hPa), or 14.7 psi. It is part of a standard day that has been established that includes a standard temperature of 15 °C at sea level. Specific standard day values have also been established for air density, volume, and viscosity. All of these values are developed averages since the atmosphere is continuously fluctuating. They are used by engineers when designing instrument systems and are sometimes used by technicians and pilots. Often, using a standard value for atmospheric pressure is more desirable than using the actual value. For example, at 18,000 feet and above, all aircraft use 29.92 "Hg as a reference pressure for their instruments to indicate altitude. This results in altitude indications in all cockpits being identical. Therefore, an accurate means is established for maintaining vertical separation of aircraft flying at these high altitudes. The most important instrument used by the pilot to perceive the health of an engine is the engine oil pressure gauge. [Figure 5] Oil pressure is usually indicated in psi. The normal operating range is typically represented by a green arc on the circular gauge. For exact acceptable operating range, consult the manufacturer’s operating and maintenance data. In reciprocating and turbine engines, oil is used to lubricate and cool bearing surfaces where parts are rotating or sliding past each other at high speeds. A loss of pressurized oil to these areas would rapidly cause excessive friction and over temperature conditions, leading to catastrophic engine failure. As mentioned, aircraft using analog instruments often use direct reading Bourdon tube oil pressure gauges. Figure 5 shows the instrument face of a typical oil pressure gauge of this type. Digital instrument systems use an analog or digital remote oil pressure sensing unit that sends output to the computer, driving the display of oil pressure value(s) on the aircraft’s cockpit display screens. Oil pressure may be displayed in a circular or linear gauge fashion and may even include a numerical value on screen. Often, oil pressure is grouped with other engine parameter displays on the same page or portion of a page on the display. 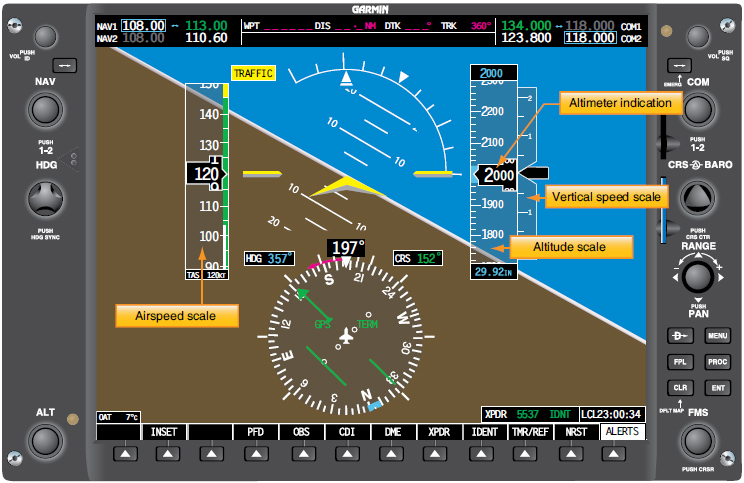 Figure 6 shows this grouping on a Garmin G1000 digital instrument display system for general aviation aircraft. An analog oil pressure gauge is driven by a Bourdon tube. In reciprocating engine aircraft, the manifold pressure gauge indicates the pressure of the air in the engine’s induction manifold. This is an indication of power being developed by the engine. The higher the pressure of the fuel air mixture going into the engine, the more power it can produce. For normally aspirated engines, this means that an indication near atmospheric pressure is the maximum. Turbocharged or supercharged engines pressurize the air being mixed with the fuel, so full power indications are above atmospheric pressure. Most manifold pressure gauges are calibrated in inches of mercury, although digital displays may have the option to display in a different scale. A typical analog gauge makes use of an aneroid described above. When atmospheric pressure acts on the aneroid inside the gauge, the connected pointer indicates the current air pressure. A line running from the intake manifold into the gauge presents intake manifold air pressure to the aneroid, so the gauge indicates the absolute pressure in the intake manifold. 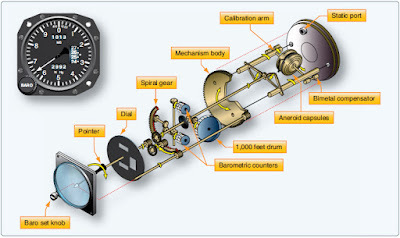 An analog manifold pressure gauge, along with its internal workings, is shown in Figure 7. 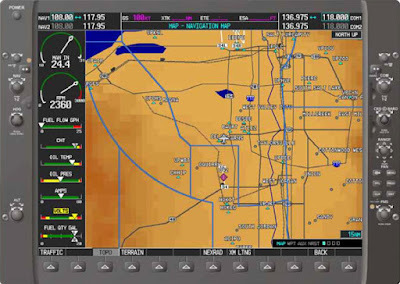 The digital presentation of manifold pressure is at the top of the engine instruments displayed on the Garmin G1000 multifunctional display in Figure 6. The aircraft’s operating manual contains data on managing manifold pressure in relation to fuel flow and propeller pitch and for achieving various performance profiles during different phases of run-up and flight. Fuel pressure gauges also provide critical information to the pilot. Typically, fuel is pumped out of various fuel tanks on the aircraft for use by the engines. A malfunctioning fuel pump, or a tank that has been emptied beyond the point at which there is sufficient fuel entering the pump to maintain desired output pressure, is a condition that requires the pilot’s immediate attention. While direct-sensing fuel pressure gauges using Bourdon tubes, diaphragms, and bellows sensing arrangements exist, it is particularly undesirable to run a fuel line into the cockpit, due to the potential for fire should a leak develop. Therefore, the preferred arrangement is to have whichever sensing mechanism that is used be part of a transmitter device that uses electricity to send a signal to the indicator in the cockpit. Sometimes, indications monitoring the fuel flow rate are used instead of fuel pressure gauges. 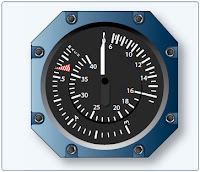 Numerous other pressure monitoring gauges are used on complex aircraft to indicate the condition of various support systems not found on simple light aircraft. Hydraulic systems are commonly used to raise and lower landing gear, operate flight controls, apply brakes, and more. Sufficient pressure in the hydraulic system developed by the hydraulic pump(s) is required for normal operation of hydraulic devices. 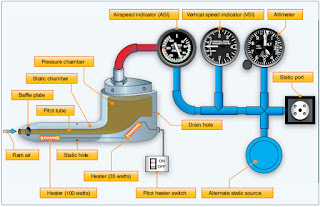 Hydraulic pressure gauges are often located in the cockpit and at or near the hydraulic system servicing point on the airframe. 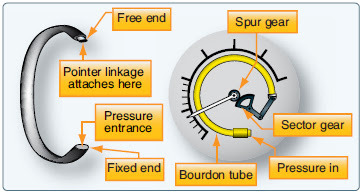 Remotely located indicators used by maintenance personnel are almost always direct reading Bourdon tube type gauges. Cockpit gauges usually have system pressure transmitted from sensors or computers electrically for indication. 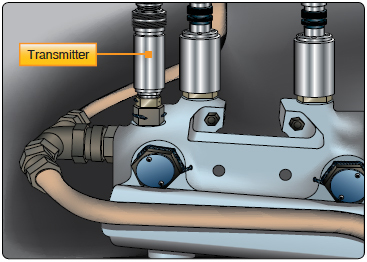 Figure 9 shows a hydraulic pressure transmitter in place in a high-pressure aircraft hydraulic system. 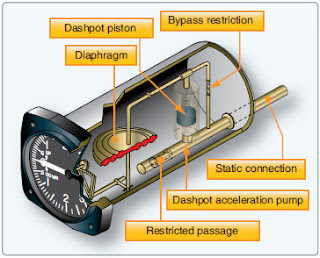 A hydraulic pressure transmitter senses and converts pressure into an electrical output for indication by the cockpit gauge or for use by a computer that analyzes and displays the pressure in the cockpit when requested or required. Gyro pressure gauge, vacuum gauge, or suction gauge are all terms for the same gauge used to monitor the vacuum developed in the system that actuates the air driven gyroscopic flight instruments. Air is pulled through the instruments, causing the gyroscopes to spin. The speed at which the gyros spin needs to be within a certain range for correct operation. This speed is directly related to the suction pressure that is developed in the system. The suction gauge is extremely important in aircraft relying solely on vacuumoperated gyroscopic flight instruments. Vacuum is a differential pressure indication, meaning the pressure to be measured is compared to atmospheric pressure through the use of a sealed diaphragm or capsule. The gauge is calibrated in inches of mercury. It shows how much less pressure exists in the system than in the atmosphere. In aviation, it is often sufficient to simply monitor whether the pressure developed by a certain operating system is too high or too low, so that an action can take place should one of these conditions occur. This is often accomplished through the use of a pressure switch. A pressure switch is a simple device usually made to open or close an electric circuit when a certain pressure is reached in a system. It can be manufactured so that the electric circuit is normally open and can then close when a certain pressure is sensed, or the circuit can be closed and then opened when the activation pressure is reached. 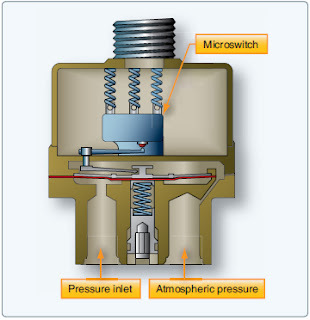 Pressure switches contain a diaphragm to which the pressure being sensed is applied on one side. The opposite side of the diaphragm is connected to a mechanical switching mechanism for an electric circuit. Small fluctuations or a buildup of pressure against the diaphragm move the diaphragm, but not enough to throw the switch. Only when pressure meets or exceeds a preset level designed into the structure of the switch does the diaphragm move far enough for the mechanical device on the opposite side to close the switch contacts and complete the circuit. [Figure 10] Each switch is rated to close (or open) at a certain pressure, and must only be installed in the proper location. A low oil pressure indication switch is a common example of how pressure switches are employed. It is installed in an engine so pressurized oil can be applied to the switch’s diaphragm. Upon starting the engine, oil pressure increases and the pressure against the diaphragm is sufficient to hold the contacts in the switch open. As such, current does not flow through the circuit and no indication of low oil pressure is given in the cockpit. Should a loss of oil pressure occur, the pressure against the diaphragm becomes insufficient to hold the switched contacts open. When the contacts close, they close the circuit to the low oil pressure indicator, usually a light, to warn the pilot of the situation. 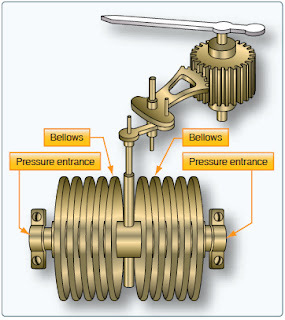 Pressure gauges for various components or systems work similarly to those mentioned above. Some sort of sensing device, appropriate for the pressure being measured or monitored, is matched with an indicating display system. If appropriate, a properly rated pressure switch is installed in the system and wired into an indicating circuit. Some of the most important flight instruments derive their indications from measuring air pressure. Gathering and distributing various air pressures for flight instrumentation is the function of the pitot-static system. 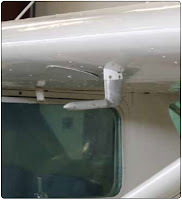 On simple aircraft, this may consist of a pitot-static system head or pitot tube with impact and static air pressure ports and leak-free tubing connecting these air pressure pickup points to the instruments that require the air for their indications. 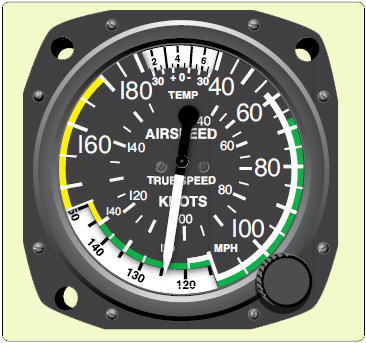 The altimeter, airspeed indicator, and vertical speed indicator are the three most common pitot-static instruments. Figure 11 illustrates a simple pitot-static system connected to these three instruments. 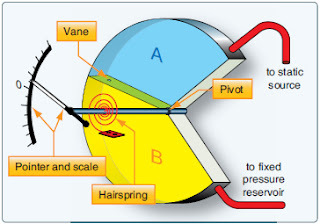 A pitot tube is shown in Figure 12. It is open and faces into the airstream to receive the full force of the impact air pressure as the aircraft moves forward. This air passes through a baffled plate designed to protect the system from moisture and dirt entering the tube. Below the baffle, a drain hole is provided, allowing moisture to escape. The ram air is directed aft to a chamber in the shark fin of the assembly. An upright tube, or riser, leads this pressurized air out of the pitot assemble to the airspeed indicator. The aft section of the pitot tube is equipped with small holes on the top and bottom surfaces that are designed to collect air pressure that is at atmospheric pressure in a static, or still, condition. [Figure 12] The static section also contains a riser tube and the air is run out the pitot assembly through tubes and is connected to the altimeter, the airspeed indicator, and the vertical speed indicator. 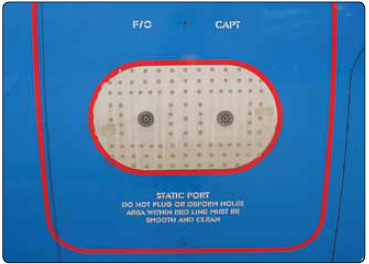 Many pitot-static tube heads contain heating elements to prevent icing during flight. The pilot can send electric current to the element with a switch in the cockpit when ice-forming conditions exist. Often, this switch is wired through the ignition switch so that when the aircraft is shut down, a pitot tube heater inadvertently left on does not continue to draw current and drain the battery. Caution should be exercised when near the pitot tube, as these heating elements make the tube too hot to be touched without receiving a burn. Most aircraft equipped with a pitot-static tube have an alternate source of static air pressure provided for emergency use. The pilot may select the alternate with a switch in the cockpit should it appear the flight instruments are not providing accurate indications. On low-flying unpressurized aircraft, the alternate static source may simply be air from the cabin. [Figure 14] On pressurized aircraft, cabin air pressure may be significantly different than the outside ambient air pressure. If used as an alternate source for static air, instrument indications would be grossly inaccurate. In this case, multiple static vent pickup points are employed. All are located on the outside of the aircraft and plumbed so the pilot can select which source directs air into the instruments. On electronic flight displays, the choice is made for which source is used by the computer or by the flight crew. Another type of pitot-static system provides for the location of the pitot and static sources at separate positions on the aircraft. The pitot tube in this arrangement is used only to gather ram air pressure. Separate static vents are used to collect static air pressure information. Usually, these are located flush on the side of the fuselage. [Figure 15] There may be two or more vents. A primary and alternate source vent is typical, as well as separate dedicated vents for the pilot and first officer’s instruments. Also, two primary vents may be located on opposite sides of the fuselage and connected with Y tubing for input to the instruments. This is done to compensate for any variations in static air pressure on the vents due to the aircraft’s attitude. Regardless of the number and location of separate static vents, they may be heated as well as the separate ram air pitot tube to prevent icing. 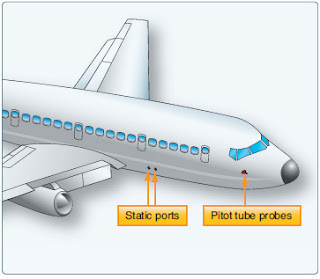 The pitot-static systems of complex, multiengine, and pressurized aircraft can be elaborate. Additional instruments, gauges, the autopilot system, and computers may need pitot and static air information. Figure 16 shows a pitot-static system for a pressurized multiengine aircraft with dual analog instrument panels in the cockpit. The additional set of flight instruments for the copilot alters and complicates the pitot-static system plumbing. Additionally, the autopilot system requires static pressure information, as does the cabin pressurization unit. Separate heated sources for static air pressure are taken from both sides of the airframe to feed independent static air pressure manifolds; one each for the pilot’s flight instruments and the copilot’s flight instruments. This is designed to ensure that there is always one set of flight instruments operable in case of a malfunction. Essentially, all pressures and temperatures captured by sensors are fed into the ADC. Analog units utilize transducers to convert these to electrical values and manipulate them in various modules containing circuits designed to make the proper compensations for use by different instruments and systems. A DADC usually receives its data in digital format. Systems that do not have digital sensor outputs will first convert inputs into digital signals via an analog-to-digital converter. Conversion can take place inside the computer or in a separate unit designed for this function. 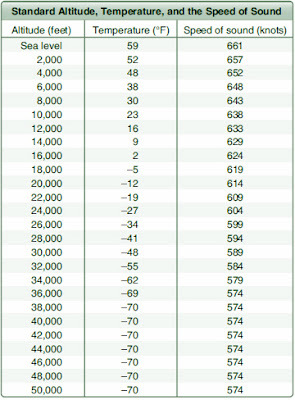 Then, all calculation and compensations are performed digitally by the computer. Outputs from the ADC are electric to drive servo motors or for use as inputs in pressurization systems, flight control units, and other systems. DADC outputs are distributed to these same systems and the cockpit display using a digital data bus. There are numerous benefits of using ADCs. Simplification of pitot-static plumbing lines creates a lighter, simpler, system with fewer connections, so it is less prone to leaks and easier to maintain. One-time compensation calculations can be done inside the computer, eliminating the need to build compensating devices into numerous individual instruments or units of the systems using the air data. DADCs can run a number of checks to verify the plausibility of data received from any source on the aircraft. Thus, the crew can be alerted automatically of a parameter that is out of the ordinary. Change to an alternate data source can also be automatic so accurate flight deck and systems operations are continuously maintained. In general, solid-state technology is more reliable and modern units are small and lightweight. Figure 18 shows a schematic of how a DADC is connected into the aircraft’s pitot-static and other systems. The basic flight instruments are directly connected to the pitot-static system on many aircraft. Analog flight instruments primarily use mechanical means to measure and indicate various flight parameters. Digital flight instrument systems use electricity and electronics to do the same. 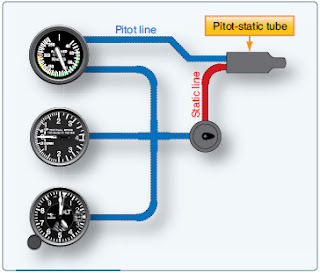 Discussion of the basic pitot-static flight instruments begins with analog instruments to which further information about modern digital instrumentation is added. Many altimeters also contain linkages that rotate a numerical counter in addition to moving pointers around the dial. This quick reference window allows the pilot to simply read the numerical altitude in feet. The motion of the rotating digits or drum-type counter during rapid climb or descent makes it difficult or impossible to read the numbers. Reference can then be directed to the classic clock-style indication. 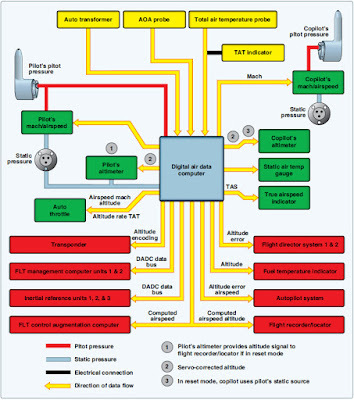 Figure 22 illustrates the inner workings behind this type of mechanical digital display of pressure altitude. 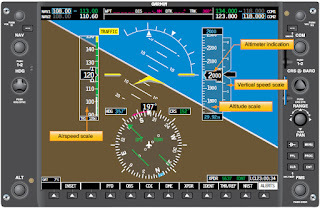 True digital instrument displays can show altitude in numerous ways. Use of a numerical display rather than a reproduction of the clock-type dial is most common. Often a digital numeric display of altitude is given on the electronic primary flight display near the artificial horizon depiction. A linear vertical scale may also be presented to put this hard numerical value in perspective. An example of this type of display of altitude information is shown in Figure 23. Accurate measurement of altitude is important for numerous reasons. The importance is magnified in instrument flight rules (IFR) conditions. For example, avoidance of tall obstacles and rising terrain relies on precise altitude indication, as does flying at a prescribed altitude assigned by air traffic control (ATC) to avoid colliding with other aircraft. Measuring altitude with a pressure measuring device is fraught with complications. Steps are taken to refine pressure altitude indication to compensate for factors that may cause an inaccurate display. A major factor that affects pressure altitude measurements is the naturally occurring pressure variations throughout the atmosphere due to weather conditions. Different air masses develop and move over the earth’s surface, each with inherent pressure characteristics. These air masses cause the weather we experience, especially at the boundary areas between air masses known as fronts. Accordingly, at sea level, even if the temperature remains constant, air pressure rises and falls as weather system air masses come and go. 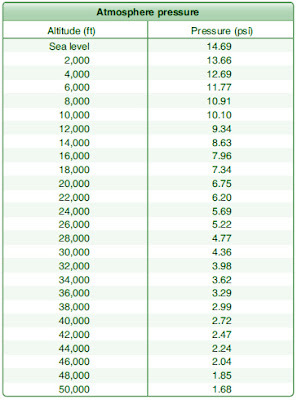 The values in Figure 19, therefore, are averages for theoretical purposes. To maintain altimeter accuracy despite varying atmospheric pressure, a means for setting the altimeter was devised. 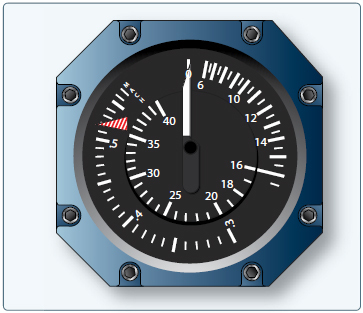 An adjustable pressure scale visible on the face of an analog altimeter known as a barometric or Kollsman window is set to read the existing atmospheric pressure when the pilot rotates the knob on the front of the instrument. 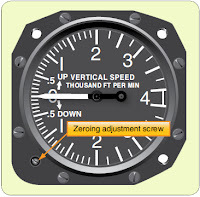 This adjustment is linked through gears inside the altimeter to move the altitude indicating pointers on the dial as well. By putting the current known air pressure (also known as the altimeter setting) in the window, the instrument indicates the actual altitude. This altitude, adjusted for atmospheric pressure changes due to weather and air mass pressure inconsistency, is known as the indicated altitude. It must be noted that in flight the altimeter setting is changed to match that of the closest available weather reporting station or airport. This keeps the altimeter accurate as the flight progresses. While there was little need for exact altitude measurement in early fixed wing aviation, knowing one’s altitude provided the pilot with useful references while navigating in the three dimensions of the atmosphere. As air traffic grew and the desire to fly in any weather conditions increased, exact altitude measurement became more important and the altimeter was refined. In 1928, Paul Kollsman invented the means for adjusting an altimeter to reflect variations in air pressure from standard atmospheric pressure. The very next year, Jimmy Doolittle made his successful flight demonstrating the feasibility of instrument flight with no visual references outside of the cockpit using a Kollsman sensitive altimeter. Temperature also affects the accuracy of an altimeter. The aneroid diaphragms used in altimeters are usually made of metal. Their elasticity changes as their temperature changes. This can lead to a false indication, especially at high altitudes when the ambient air is very cold. A bimetallic compensating device is built into many sensitive altimeters to correct for varying temperature. Figure 22 shows one such device on a drum-type altimeter. Temperature also affects air density, which has great impact on the performance of an aircraft. Although this does not cause the altimeter to produce an errant reading, flight crews must be aware that performance changes with temperature variations in the atmosphere. The term density altitude describes altitude corrected for nonstandard temperature. That is, the density altitude is the standard day altitude (pressure altitude) at which an aircraft would experience similar performance as it would on the non-standard day currently being experienced. For example, on a very cold day, the air is denser than on a standard day, so an aircraft performs as though it is at a lower altitude. The density altitude is lower that day. On a very hot day, the reverse is true, and an aircraft performs as though it were at a higher elevation where the air is less dense. The density altitude is higher that day. 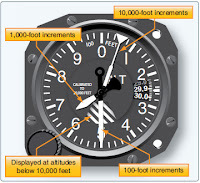 Other factors can cause an inaccurate altimeter indication. Scale error is a mechanical error whereby the scale of the instrument is not aligned so the altimeter pointers indicate correctly. Periodic testing and adjustment by trained technicians using calibrated equipment ensures scale error is kept to a minimum. The pressure altimeter is connected to the pitot-static system and must receive an accurate sample of ambient air pressure to indicate the correct altitude. Position error, or installation error, is that inaccuracy caused by the location of the static vent that supplies the altimeter. While every effort is made to place static vents in undisturbed air, airflow over the airframe changes with the speed and attitude of the aircraft. The amount of this air pressure collection error is measured in test flights, and a correction table showing the variances can be included with the altimeter for the pilot’s use. Normally, location of the static vents is adjusted during these test flights so that the position error is minimal. 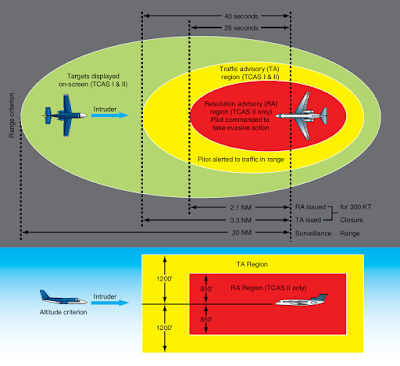 [Figure 26] Position error can be removed by the ADC in modern aircraft, so the pilot need not be concerned about this inaccuracy. Static system leaks can affect the static air input to the altimeter or ADC resulting in inaccurate altimeter indications. It is for this reason that static system maintenance includes leak checks every 24 months, regardless of whether any discrepancy has been noticed. See the instrument maintenance section toward the end of this chapter for further information on this mandatory check. It should also be understood that analog mechanical altimeters are mechanical devices that often reside in a hostile environment. The significant vibration and temperature range swings encountered by the instruments and the pitot static system (i.e., the tubing connections and fittings) can sometime create damage or a leak, leading to instrument malfunction. Proper care upon installation is the best preventive action. Periodic inspection and testing can also insure integrity. The mechanical nature of the analog altimeter’s diaphragm pressure measuring apparatus has limitations. The diaphragm itself is only so elastic when responding to static air pressure changes. Hysteresis is the term for when the material from which the diaphragm is made takes a set during long periods of level flight. If followed by an abrupt altitude change, the indication lags or responds slowly while expanding or contracting during a rapid altitude change. 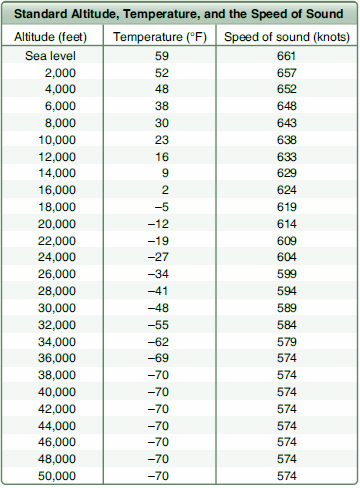 While temporary, this limitation does cause an inaccurate altitude indication. 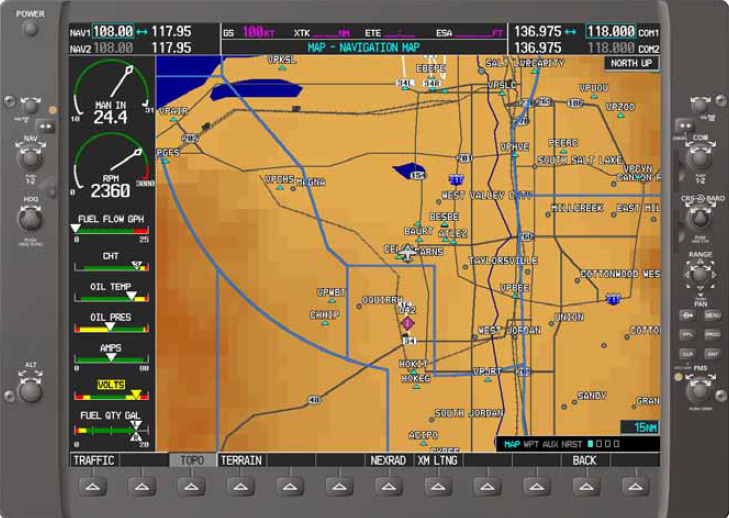 It should be noted that many modern altimeters are constructed to integrate into flight control systems, autopilots, and altitude monitoring systems, such as those used by ATC. The basic pressure-sensing operation of these altimeters is the same, but a means for transmitting the information is added. The relationship between the ram air pressure and static air pressure produces the indication known as indicated airspeed. 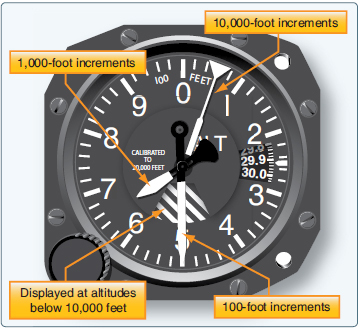 As with the altimeter, there are other factors that must be considered in measuring airspeed throughout all phases of flight. These can cause inaccurate readings or indications that are not useful to the pilot in a particular situation. In analog airspeed indicators, the factors are often compensated for with ingenious mechanisms inside the case and on the instrument dial face. Digital flight instruments can have calculations performed in the ADC so the desired accurate indication is displayed. While the relationship between ram air pressure and static air pressure is the basis for most airspeed indications, it can be more accurate. Calibrated airspeed takes into account errors due to position error of the pitot static pickups. It also corrects for the nonlinear nature of the pitot static pressure differential when it is displayed on a linear scale. Analog airspeed indicators come with a correction chart that allows cross-referencing of indicated airspeed to calibrated airspeed for various flight conditions. These differences are typically very small and often are ignored. Digital instruments have these corrections performed in the ADC. 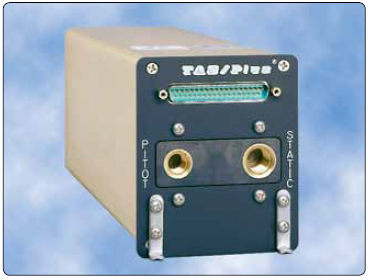 gital flight instrument systems perform all of the calculations for true airspeed in the ADC. Ram air from the pitot tube and static air from the static vent(s) are run into the sensing portion of the computer. Temperature information is also input. This information can be manipulated and calculations performed so a true airspeed value can be digitally sent to the cockpit for display. In order to safeguard against these dangers, pilots monitor airspeed closely. A maximum allowable speed is established for the aircraft during certification flight testing. This speed is known the critical Mach number or Mcrit. Mach is a term for the speed of sound. The critical Mach number is expressed as a decimal of Mach such as 0.8 Mach. This means 8⁄10 of the speed of sound, regardless of what the actual speed of sound is at any particular altitude. 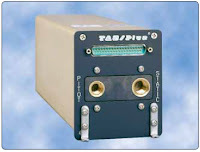 Many high performance aircraft are equipped with a Machmeter for monitoring Mcrit. 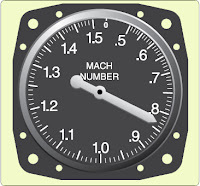 The Machmeter is essentially an airspeed instrument that is calibrated in relation to Mach on the dial. Various scales exist for subsonic and supersonic aircraft. [Figure 34] In addition to the ram air/static air diaphragm arrangement, Machmeters also contain an altitude sensing diaphragm. It adjusts the input to the pointer so changes in the speed of sound due to altitude are incorporated into the indication. Some aircraft use a Mach/airspeed indicator as shown in Figure 35. This two-inone instrument contains separate mechanisms to display the airspeed and Mach number. A standard white pointer is used to indicate airspeed in knots against one scale. A red and white striped pointer is driven independently and is read against the Mach number scale to monitor maximum allowable speed.